The most crucial game of the last round was a loss of Pacific Caesar (1-1) in Jakarta on Sunday night. Visitors were defeated by NSH (2-1) 95-81. They made 25-of-29 free shots (86.2 percent) during the game, while Pacific Caesar only scored seven points from the stripe. NSH forced 21 Pacific Caesar turnovers. Americans were the main players on the court. It was a great evening for power forward Anthony Simpson (202-87, college: Kent St.) who led his team to a victory scoring 24 points and 8 rebounds. Guard Dashaun Wiggins (188-91, college: Portland St.) helped adding 26 points and 5 rebounds. The best for the losing side was point guard Matt Van Pelt (178-91, college: Spring Arbor) with a double-double by scoring 18 points, 5 rebounds and 10 assists. Both coaches used bench players which allowed the starters a little rest for the next games. Important game to mention about took place in Pandang. Hang Tuah (2-1) saved a 3-point victory at home edging Siliwangi (1-2) 77-74 in the game for the second place. Americans were the main players on the court also this time. It was an exceptional evening for guard Gary Jacobs (188-92, college: Cent.Washington) who led the winners and scored 30 points and 6 rebounds. Jarad Scott accounted for 14 points and 13 rebounds. Forward Michael Vigilance (203-94, college: Clark Atlanta) came up with a double-double by scoring 23 points and 26 rebounds for Siliwangi in the defeat. Both coaches tested many bench players in such tough game. The game between Top Four teams took place in Jakarta. host Stapac (1-1) smashed Satya Wacana (1-2) 83-63. The best player for the winners was Savon Goodman who had a double-double by scoring 25 points, 17 rebounds and 5 assists. At the other side the best for losing team was Madarious Gibbs who recorded 26 points, 5 rebounds and 4 assists. Important game to mention about took place in Pandang. Hang Tuah (2-1) saved a 3-point victory at home edging Siliwangi (1-2) 77-74 in the game for the second place. Strangely Siliwangi outrebounded Hang Tuah 45-29 including a 22-3 advantage in offensive rebounds. It was a great shooting night for Hang Tuah especially from behind the arc, where they had solid 61.5 percentage. Americans were the main players on the court also this time. It was an exceptional evening for guard Gary Jacobs (188-92, college: Cent.Washington) who led the winners and scored 30 points and 6 rebounds. Forward Jarad Scott (203-95, college: Union, TN) accounted for 14 points and 13 rebounds for the winning side. Jacobs is a former Eurobasket Summer League player, which is considered top summer league for players who want to play basketball overseas. Forward Michael Vigilance (203-94, college: Clark Atlanta) came up with a double-double by scoring 23 points and 26 rebounds and point guard Martavious Irving (186-90, college: Kansas St.) added 28 points and 5 rebounds respectively for Siliwangi in the defeat. Both coaches tested many bench players in such tough game. The game between Top Four teams took place in Jakarta. host Stapac (1-1) smashed Satya Wacana (1-2) 83-63. Stapac dominated down low during the game scoring 58 of its points in the paint compared to Satya Wacana's 24. They outrebounded Satya Wacana 54-17 including a 19-2 advantage in offensive rebounds. Stapac looked well-organized offensively handing out 22 assists. The best player for the winners was American forward Savon Goodman (198, college: Shaw) who had a double-double by scoring 25 points, 17 rebounds and 5 assists. 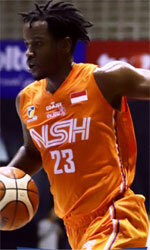 Point guard Widyantaputra Teja (181-97) chipped in 24 points, 8 rebounds and 7 assists. At the other side the best for losing team was American guard Madarious Gibbs (185-93, college: Texas Southern) who recorded 26 points, 5 rebounds and 4 assists and point guard Cassiopeia Manuputty (182-94) added 9 points and 4 assists respectively. The most crucial game of the last round was a loss of Pacific Caesar (1-1) in Jakarta on Sunday night. Visitors were defeated by NSH (2-1) 95-81. They made 25-of-29 free shots (86.2 percent) during the game, while Pacific Caesar only scored seven points from the stripe. NSH forced 21 Pacific Caesar turnovers. Americans were the main players on the court. It was a great evening for power forward Anthony Simpson (202-87, college: Kent St.) who led his team to a victory scoring 24 points and 8 rebounds. Guard Dashaun Wiggins (188-91, college: Portland St.) helped adding 26 points and 5 rebounds. The best for the losing side was point guard Matt Van Pelt (178-91, college: Spring Arbor) with a double-double by scoring 18 points, 5 rebounds and 10 assists and forward Qarraan Calhoun (203-86, college: Houston) scored 18 points and 8 rebounds. Both coaches used bench players which allowed the starters a little rest for the next games.